Activity in the Downtown St. John’s ebbs and flows like the tide. A quick glimpse of recent headlines would lead you to believe that business downtown is on the decline. However, we prefer to peer through the doom-and-gloom and see opportunity provided by recent economic challenges. Downtown businesses are undergoing a ‘stress-test’, one that any business could pass with the right preparation, or one that any business could fail due to the wrong combination of circumstances. High rent, high vacancies, low pedestrian traffic and poor parking access are not new issues to the downtown core. Current and future entrepreneurs can better prepare themselves to face these challenges by considering some key questions during the business planning process. What does the location convey about your business? Downtown St. John’s has a hip, trendy vibe that draws customers looking for unique products and services. However, novel commodities often command premium prices, and, rightly or not, consumers believe prices for goods and services are higher downtown. If your pricing strategy is based on a low selling point and high traffic, the downtown area may not be a good fit for your business. Does your customer base exist in this location, or at least have easy access to it? How will you market your business? If your location already draws significant traffic from your customer base, you may be able to invest less capital in traditional marketing campaigns. Does the location provide enough space for your current business needs, and is there room to grow? Consider what businesses have previously operated from that location – has it been vacant for ages, or has it been experiencing constant changeover? Try a Google search of the address and see what turns up. Talk to former tenants and potential neighbours. What has their experience been with the property owner? Do they own other commercial properties in the city? How well maintained are these properties and what do the current tenants have to say? Is the landlord located within the city, or do they subcontract building management? Will this hamper the response to property issues, or requesting leasehold improvements? Do the lease terms suit your current business needs? If you’re uncertain about your long-term needs, it may be best to sign a lease for a shorter duration of time. Alternatively, you may want to be in the space long enough to get the full benefit of any leasehold improvements you make. Are you allowed to renovate or make improvements in the space, and who owns the improvements after you make them? What is the current market rate for commercial space in the area? How does this location compare? Are there additional fees for maintenance of common space, snow clearing, or other incidentals? Who is responsible for property taxes, insurance, utilities and maintenance? How much and how often can your rent increase? What are the consequences of breaking your lease? Prior to signing your lease, you should take the time to read it over carefully. You should also ask a trusted business mentor, commercial real estate lawyer, realtor, or other professional to review it with you. Know the terms of your lease inside and out and be ready to contact the property owner if issues arise. Understand what amenities and services the municipality provides and how to report problems (Contact Access St. John’s by dialing 311). Get involved to improve the area for not only your business, but your neighbouring businesses too! You may consider: having informal chats and meetings with other local business owners, attending city council meetings and reaching out to councillors, serving on a committee for your local Business Improvement Area (Downtown St. John’s) or joining your local destination marketing agency (Destination St. John’s). 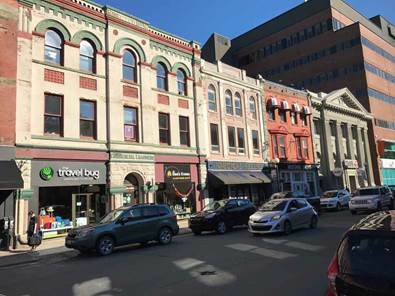 Metro Business Opportunities has many current and past clients located in this historic commercial district, so we’ve experienced the cycles of downtown St. John’s. Whether your business is already operating downtown, you are considering opening there, or you are exploring commercial lease options, there are always steps you can take to mitigate your risk.